Golden healers are on the rare side coming only in Arkansas from the Collier Creek Mine, the type locality. 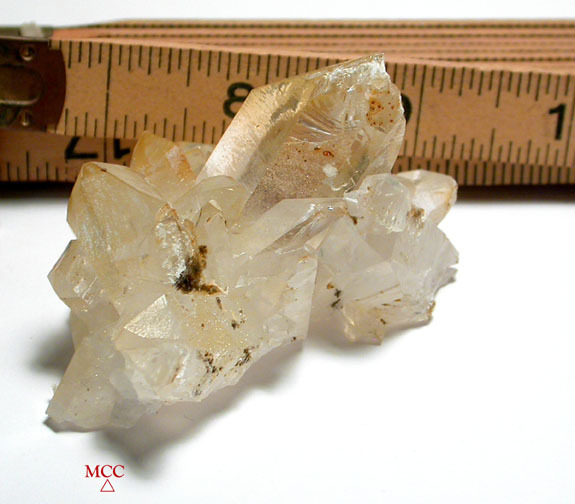 The strengthening lemon meringue to [even more rarely] reddish yellow coloring is from iron inclusion and can give opacity or an etherial glow to the quartz. This cluster, empathic and empathically priced for the conchoidal wounding to its' main crystal, ALSO has included little iron deposits under sugary clear drusy crystals. 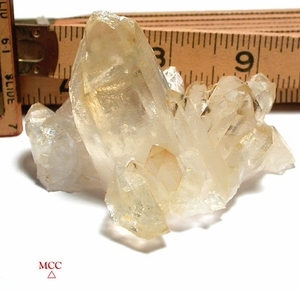 Individual crystals are very clear, some golden and some white, penetrated, doubly-terminated. Rainbows and record keepers. Overall, 2-1/4x 3x 1-7/8" tall.